The startup LuxAI was created following a research project at the Interdisciplinary Centre for Security, Reliability and Trust (SnT) of the University of Luxembourg, funded by the Luxembourg National Research Fund (FNR) under its Proof of Concept scheme. The business model of LuxAI is developing and constructing so-called social robots. Such robots can be used, for example, in the educational or health system, where they would support trainers and therapists in their work. The robots can be programmed to practice vocabulary with children or to make rehabilitation exercises with stroke patients. LuxAI has already been awarded several prizes for the development of its robot: It won third prize in the competition “Pitch your start-up”, in which 90 participants from Luxembourg, France, Germany, Italy and even Korea took part. At the Pirate Summit Luxembourg, LuxAI qualified for the Pirate Summit Global – a European start-up conference – taking place in September in Cologne. And finally in early July, LuxAI won first prize at the Mind & Market Forum in Luxembourg. LuxAI in cooperation with the Autonomous Robot Lab of the Computer Science and Communications Research Unit (CSC) of the University of Luxembourg has developed this very interface. 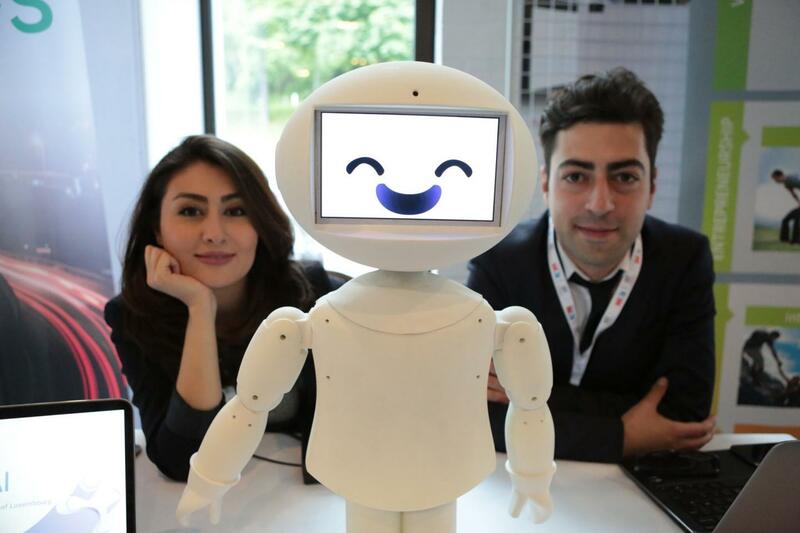 It is based on the same Android platform as is widespread on smartphones, and can make social robots suitable for the mass market, as Ziafati assures. “Non-IT-expert people have made the first tests with our robots. They were able to program the robots for their purpose within 20 minutes. Our software lets anyone do it.” Ziafati sees possibilities for many fields of application: as learning support for autistic children, in schools, in the entertainment industry or in geriatric care. “Social robots will never replace qualified personnel – but they can support them, since they have unlimited time and can take over routine tasks,” says Ziafati. LuxAI is now working with Fondation Autisme Luxembourg and three departments in the University of Luxembourg on developing applications for autism therapy and behavioural regulation, geriatric medicine and teaching foreign languages to children in kindergartens.